A clean, sparkling pool is beautiful and enjoyable. It’s also a massive energy drain. Even though pools may help us cool off, they really heat up our energy bills—a home with a pool uses up to 49 percent more electricity annually than a home without. 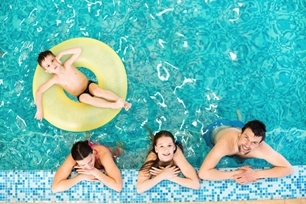 And while other factors come into play—homes with pools are often bigger, for example—there are some ways you can help prevent your energy bills from going off the deep end. Cover Up – Covering your pool when it’s not in use reduces water evaporation by up to 97 percent, and reduces the need for chemical usage. Filter Facts – Use cartridge filters instead of sand, which require backwashing to clean them. Backwashing waste water hurts the environment. Automate – Most filters only need to work six to 12 hours a day, so use a timer to save energy. During winter, you can run your filter as little as two hours a day. Sun, Sun, Sun – Consider using a solar powered pool heater and swimming pool pump. Make sure you have the right-size pump for your pool, too. Clean up – Clean your pool regularly. A clean pool means the pump and filter have to do less work. More Green – Plant a windbreak around your pool using native plants or shrubs. This will reduce the evaporation rate—just make sure the plants are far enough away so they don’t drop leaves and bark in the pool. Following these tips should help your budget stop leaking cash and make your pool more environmentally friendly. And that’s good clean fun for all.